Hotel Passy Eiffel, Paris. 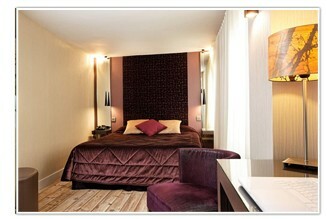 Passy Eiffel Hotel Paris. The Passy Eiffel Hotel in Paris is a destination of luxury, elegance and refinement in the heart of one of the most beautiful cities in the world. It is situated a stone's throw from the monuments and the heart of one of the most luxurious and charming quarters. From here, you can easily reach the legendary Eiffel Tour, the imposing Trocadero, the lush Bois de Bologne for walking in one of the biggest parks in the city, famous for its historical heritage. You will live a stay as in a novel, close to Champs-Elysées and its luxurious boutiques, the triumph of historical, most modern and representative clubs of the city, where you can go shopping or simply experience the unique atmosphere only Paris has to offer. Our facility, realized in line with this residential quarter, will receive you in a classy and elegant frame in order to let you spend a relaxing and excellent journey, whether you come for pleasure or business. In the morning, enjoy our flowery garden, a quiet and green oasis which is ideal to have breakfast and get relaxed before exploring Paris life. Here, you can enjoy high-quality and attentive services featuring the Passy Eiffel Hotel. Come and visit the chic heart of French capital for a memorable journey!